Your tandem skydive is over. It was amazing and breathtaking. Truly an experience to remember. Later, you try to tell your friends and family all about it. But words fail to express just how astounding it was to rush through the brilliantly blue sky, with the clouds at your very fingertips. They ask to see pictures – and most of all that video! Unfortunately – you didn’t get that skydiving video. You are not alone though. Loads of people land from their skydive, walking on air from the adrenaline and happiness. But they also experience the bite of disappointment on their drive home when they realize they opted not to get that video of their first skydive. Regret and something as magnificent as skydiving shouldn’t be a common pairing. For too many however, the two go hand in hand. This is what is commonly referred to as the skydiver’s blues. You are forced to face the fact that you have nothing to show your friends and family. Also – nothing to share on social media. And – worst of all – nothing to remember those 60 seconds of exhilaration 6 years down the line. 1. You Only Have ONE First Tandem Skydive! We get that it’s a little extra money, but “firsts” are special moments. Consider your first high school prom, your first day of college, or your first time traveling abroad. Maybe even your first dance as a married couple, or that tender first step of your child. You probably have mementos of those firsts captured on photo or video somewhere (even if it’s negatives, slide film or VHS). And if you don’t – you’ve probably experienced the slight twinge of regret the lack of recording those moments has brought to you. Skydiving is no different. Even if you go on to do thousands of skydives, you’ll never have another first tandem jump. 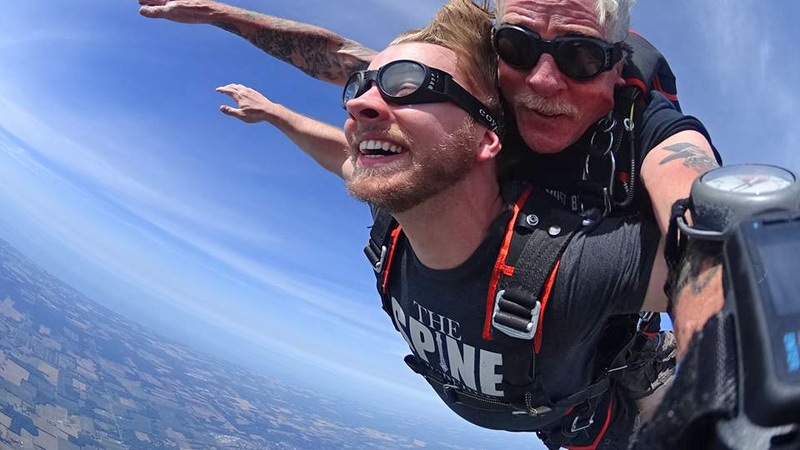 Tim Allen – WNY’s dropzone owner – knows the value of photo and skydiving video firsthand. Tim made his first skydive in Cancun, Mexico, many years ago. Though he was a college student with limited funds and hesitant to add the extra expense, he was eventually convinced by the owner of the dropzone to spring the cash for photos. Well, wouldn’t you know it – Tim now has nearly 7,000 jumps under his belt. And he is super grateful he was convinced so many years ago to get those photos. So much so, the pictures from his first skydive hang on a wall in his home. If that isn’t a testament to the special nature of a first skydive, we don’t know what is. Sure, just about anyone can pick up a camera these days, snap a few shots and get lucky with some good ones. But, we promise there are VERY few people who can fly their bodies with expert skill, while beautifully framing a tandem pair. Particularly while falling through the air at 120 mph. Our skydiving photographers/videographers often utilize multiple cameras too. They are mounted on helmets and wrists, triggering the shutter by bite or blow switch – all while sporting a smile. This kind of multitasking is truly next level and takes some serious skill! Wanna see? Check it out! And that’s YOU – the star of the production! We have videographers staffed and ready to capture the pure magic of your first tandem skydive for you. What do you say? Want to make a skydive today? We can’t wait to see you at the dropzone!